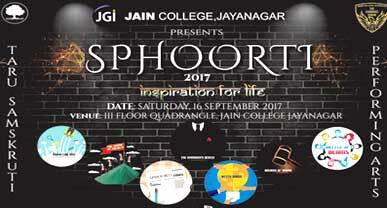 To continue the old tradition, Jain College, Jayanagar campus will be organizing its annual inter-collegiate commerce fest 'Sphoorti – Inspiration for Life' on 16 September 2017. The magnificent fest is a platform to bring out the best talent among the participants. It provides an opportunity to showcase their talent and experience the tough competition to win the prizes. The fest will comprise of various on-stage and off-stage events such as Battle of Beams, The Marketing Mix, The Degrees of Drama, The Over Seer's Acuity, Witty's Brood, The House of Dalals and Sphoorti Times. All these events are designed to inspire everyone who will be a part of the fest as the word' Sphoorti' means 'inspiration' in Sanskrit. On this occasion, the enthusiastic students and staff of Jain College invite students and faculty members of various institutions and universities to take part in this spectacular event and experience the extravaganza.